— Empathizing to design a VUI experience. Users can ask for information about upcoming activities to make social planning easier. For this team project, we were tasked with designing a communicative voice UI (VUI) from inception to a live prototype that solves a validated problem. No one on the team had designed a VUI before. In addition we had only five class days until we needed to present a live prototype to industry leaders. No pressure! Our first step was to brainstorm a problem - one that could be solved using a voice UI. After quickly ideating potential directions, we voted on a product idea. How might we use a VUI to help people find out what fun things are going on this weekend? We needed to first research VUIs. What are they? What needs to be considered when creating one? By coincidence, a local company (Voxable) that specializes in VUIs held a free workshop during Austin Design Week. A few of us attended and learned how to craft a conversational design strategy using a VUI. In addition, a book Designing Voice User Interfaces by Cathy Pearl was invaluable in helping me understand key concepts and think of practical ways to eventually test our VUI application with users. Who will use our product? Why are we designing for them? When and where will they use it? What are the benefits for users? explore their experiences with VUI. We wanted to better understand how people find out about weekend activities so that we could design a concept directly based on these insights. I created a draft discussion guide that our team tweaked to ensure we were uncovering relevant information tied into our goals. 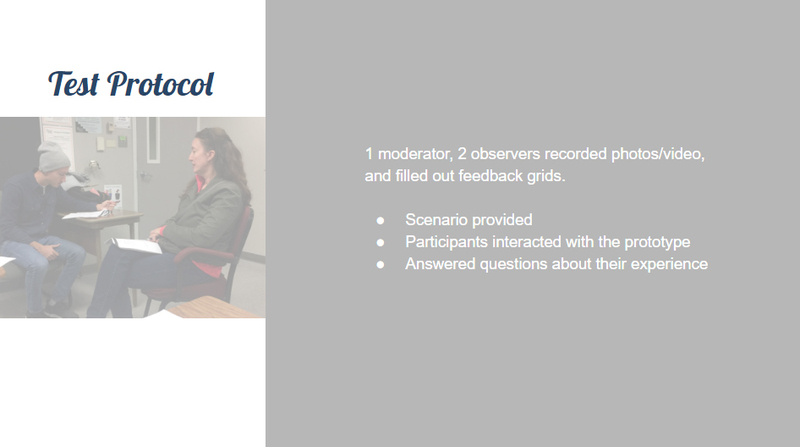 Each member of our team interviewed two people who we pre-screened as actively social. Next, I led an affinity mapping exercise to organize the information we gleaned from our interviews. We pulled relevant statements from our eight interview transcripts and transferred them to sticky notes. Similar statements were grouped. This method helped us quickly see patterns and go from chaos to connections. I digitized our findings using a whiteboard in MURAL. Surprisingly, our interviewees did not plan social events in advance. Convenience, money, time, and nearness were the most important factors to them when thinking about going out. Friends often gave them ideas. These findings were critical in influencing the direction of our VUI. It needed to be a tool for last-minute planning that replicated a friend relationship. 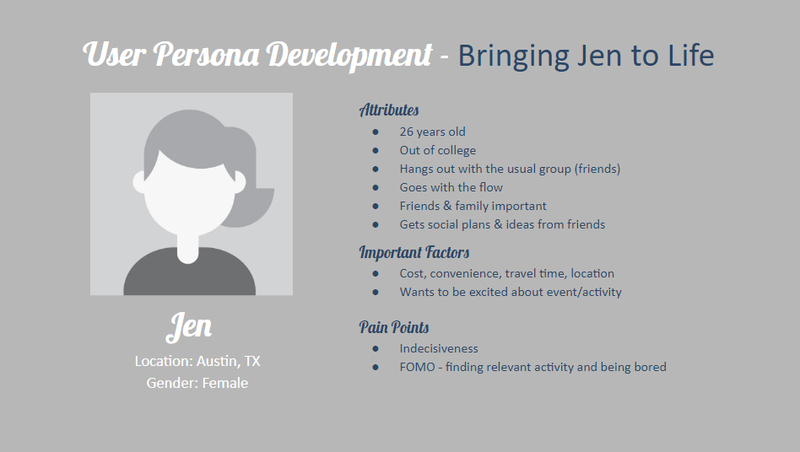 We crafted a user persona to help guide us in creating our VUI concept. It directly tied into these user insights we learned from our interviews. Whenever we made design decisions (from conversational strategy to task flow) we referred back to this document to make sure we were on track. One of the things we learned in our workshop was that we should also create a VUI persona. We needed to craft a personality for our product to help simulate the conversational tone our user wanted. At this point we needed to decide how our users would physically interact with our product. Would they want to use Google Home, Siri, Amazon Alexa or something else? User insights told us that they might search for the information at home or on their phone. We made the decision to build an Alexa Skill. This solution allowed users to access the product in either location. Because of Alexa product constraints and our developing content strategy, we changed the name to Freetime. I want to see a band tonight. While we were considering these products, I researched how we would conduct usability tests for VUIs using these methods. Our Lead Interaction Designer ultimately chose the product Sayspring for our final prototype. A free trial allowed us to play with it. She developed a test version over the weekend that let us explore multiple user utterances as well as curate the responses. We tweaked it on Monday morning. I worked on developing a test protocol for it that day and lined up test participants for Wednesday. The VUI provided accurate information based on my requests. The VUI was time intensive. The conversation flow was natural. Overall, interacting with the prototype was what I would expect? Our highest scores were on information accuracy and friendliness. One tester even described the VUI as “A friend who has great ideas.” This showed us that we were on target with aligning the tone of our product to what we envisioned for our persona. Our lowest scores were on time intensity and information clarity. An issue we quickly noticed from testing was that we didn't inform users up front when their options were limited. This led to confusion and loops in conversations. We further refined the prototype to make it quicker and clearer for users to interact with. Based on feedback, we modified it to clarify limitations and add additional response options. Additional testing is needed, not only to test against the baseline we established in our first round of usability testing, but also to learn how users adapt as they use the product repeatedly. How does their experience level influence their expectations? Does it change what - or how they ask? If a GUI is working in concert with the VUI, is clarity improved? It's exciting to think about all the future possibilities for this technology. This project was purposely vague and a lot to tackle in a tight timeframe. It reflects the ambiguity of projects I might encounter in my future UX roles. It will be my job as UX Designer to isolate and make sense of the problem even with constraints looming. I enjoyed exploring and collaborating with my team to work iteratively towards a solution. What fun to go to a Voxable workshop, explore books and begin to learn a new UI! So this wasn't a new lesson - but one that was underscored by this project. It definitely raises the bar when you have teammates who want to be challenged too! “Your leadership skills early on in the project - when it was at its most ambiguous - was excellent.